Santos-Dumont had already won the Deutsche prize of 1,00,000 Francs, flying an airship (balloon), around the Eif­fel Tower (Fig. 3.1). He now turned his attention to gliders and kites. Could he install a motor and steer them along? How would such flights be different from those on dirigi­bles (balloons powered by motors)? The possibilities seemed immense. So Santos-Dumont resolved to master the art of flying a giant kite, powered by a motor. He read all avail­able material on kites and gliders. Soon he was familiar with their designs. Among his friends were professors and engineers. They educated him on the role of aerodynamics in designing kites. They suggested a box-type kite. The frame would be made of wood. The body would be covered with muslin. The en­gine would be suitably mounted. The kite would fly tail first. 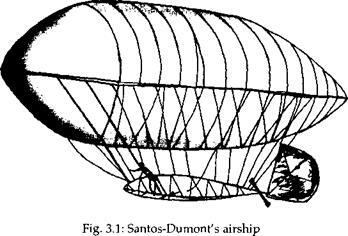 Santos-Dumont spent a huge sum, designing the kite. Alas! He didn’t know that the Wright brothers had beaten him in the race for honours. In September 1906, he was ready to fly a giant box-shaped kite. It had two sets of wings and was mounted on bicycle wheels. This, the designer said, would facilitate smooth landing. An eight-cylinder Antoinette engine was installed. The kite got airborne. It flew, tail forward, for 8 sec, covering a distance of 11.3 m. The landing was smooth. On 12 November 1906, Santos – Dumont repeated the experiment. He flew 155 m in 22 sec. Everyone hailed him as a pioneer. Santos-Dumont be­lieved he had created history. He basked in the limelight, but this euphoria did not last long. He learnt of the Wright brothers and of their flight, at Kitty Hawk, in December 1903. He had struggled against all odds, only to come second in the race. That was a severe blow. But he was the first man to circle the Eiffel Tower in a dirigible. That gave him some consolation. It assured him a place in the roll of honour in the history of aviation. In 1909, Lord Radcliffe of The Daily Mail, London, of­fered a prize (value about Rs. 1 lakh then) to the first man who flew an aircraft across the English Channel. Many young men considered the offer, but backed out when they became aware of the grave risks. unpredictable. Gusty winds and spiralling air currents could toss the aircraft around, tear it apart; or the engine could get flooded with gasoline and stop working. The risk was worth taking, thought Louis Bleriot, of France (Fig. 3.2).. Flying was his hobby. He was a daredevil. Many were the tum­bles that he took during his previous flights with kites and gliders. He had broken his skull; pulled his calf mus­cle; limped for a fortnight after being thrown out of a glider, as it came in to land; received hard knocks and se­vere bruises on several occasions. These painful experiences, however, did not dampen his love for flying. He returned to fly after periods of enforced rest, after the mishaps. Bleriot heard about the prize. He designed a mono­plane. (Each wing had a span of 7 m), mounted on three wheels, two in front and one in the rear. A three-cylinder Anzani engine provided the power. It was ready by the middle of July 1909. Bleriot made plans to take off from the open ground at Le Baraques, Calais. Hubert Latham, a leading flyer of France, too was after the prize money. He set out from Sangatte near Calais on 19 July 1909. The engine developed trouble while flying over the Channel. It spluttered, coughed, went into convulsions and then ceased to work. The aircraft lost height. Latham landed on choppy waters. A French naval vessel rescued him. He tried and failed. Latham would try again, thought Bleriot. He was still on crutches, after a recent accident. Yet he decided to take the challenge. He told his friends, "It’s only a short flight. It shouldn’t take more than forty minutes. So please keep watch. When the weather holds good, I shall fly". Bleriot was still in bed at 3 a. m. on 25 July 1909, when he was woken up by sharp knocks on the door. He sat up in bed. The pounding on the door continued. It took Bleriot some time to get hold of the crutches, adjust them and hob­ble to the door. Framed against the door stood a friend. "Good Morning. We’ve been told that the weather shall hold today. So…" the friend walked in. "Wonderful. I shall be ready in a minute", Bleriot hur­ried to the bathroom. Bleriot took the monoplane, the BLERIOT XI, on a test flight, circled the ground twice and came back for gas. After filling the fuel tank, he restarted the engine. His friends crowded near the cockpit. He shook hands with them. As they drew back, he pulled the throttle. The aircraft rolled on, picked up speed and took to the air gracefully (Fig. 3.3). The men on the ground cheered. Someone checked the time. It was 4.35 a. m.
The aircraft flew at a height of 75 m. A French naval ship sailed the Channel, keeping an eye on the aircraft. It was assigned to help Bleriot in case his aircraft developed trouble and he was forced to land on the waters. over the Channel. He flew so fast (64 kmph) that the ship was left far behind. He had no compass and did not know whether he was heading in the right direction. He was half way through when the engine hissed. It was getting heated. A nameless fear gripped him. Would the engine fail him, force him to down his aircraft in the waters of the Channel? He felt a blob of water on his cheek. He reached out for it, and his hand became wet with raindrops. The rain came just in time. It cooled the engine. The aircraft flew on, without any further trouble. Bleriot sighted the cliffs of Do­ver, to the west of his flight path, and changed the direc­tion. The aircraft now pushed against the wind, headed to­ward Dover. Bleriot touched down on a green field, at Northfall Meadow, just behind Dover Castle. (It was close to the spot from where two balloonists, Dr Jeffries and Blanchard, had undertaken the first balloon flight across the Channel, more than hundred years back). Bleriot won the prize and the laurels. A month later Bleriot entered the Great Air Meet at Reims in France. He competed with more than 30 pilots. But he lost. Glenn Curtiss of the United States recorded a speed of 77 kmph and won top honours (Fig. 3.4). It was one more feather in Glenn’s cap. Earlier he had bagged prizes offered by the Scientific American and the New York Aero Club. The organisations wanted to find out how much con­trol man had gained over the aircraft. Could anyone fly on a day, specified in advance? Could he cover a distance of at least 1 km? Such a man deserved the prize. Curtiss accepted the challenge. He announced in advance that he would fly on 4 July 1908 (National Day of the United States). sky clear. Curtiss climbed into the cockpit of his plane, the June Bug. He started the motor, opened up the throttle and nudged the aircraft into flight. He groaned when the flight ended after covering less than 1 km. He tried again. This time, he covered nearly 2 km. Sweet were the fruits of success. Curtiss savoured his victory. He had proved that one could fly at any time of one’s choosing. Could the aircraft help national defence? Experts studied the possibil­ity. But they didn’t bring a sense of urgency to the task. For the world was at peace. There were minor skirmishes, but they didn’t streak the sky with war clouds. An assassina­tion whipped up the power needed to herd in the clouds to darken the scene.